Annemarie first began yoga as a teenager in New York and discovered the Iyengar method when she came to Bristol in 1997. She immediately recognised the benefits that Iyengar yoga could bring: a feeling of well-being, calm and challenge. She loves its lineage, rigorous methodology, and clarity. She was inspired to teach after attending the 2009 UK convention taught by Geeta Iyengar (BKS Iyengar’s daughter). She holds a Junior Intermediate 2 level certificate and has taken classes at the Ramamani Iyengar Institute (RIMYI) in Pune. 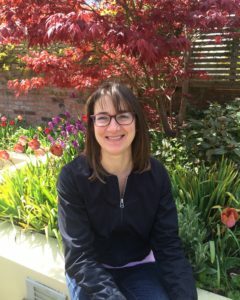 She regularly attends the Iyengar UK annual conventions which are taught by teachers from RIYMI as well as learning from senior teachers near, far and wide.